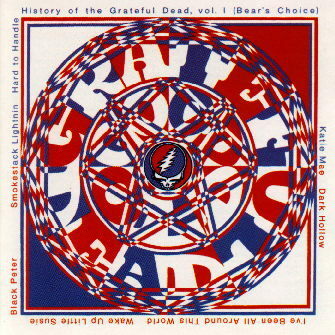 Recorded over two nights in early 1970, History of The Grateful Dead, Vol. 1 (Bear's Choice) spotlights some choice in-concert staples from the most popular live attraction in rock & roll history. Produced by the legendary Owsley Stanley and recorded by longtime Dead associate Bear, the album's seven cuts include an 18-minute version of the perennial "Smokestack Lightnin," along with such classic crowd pleasers as "Dark Hollow," "Wake Up Little Susie" and a masterful rendition of the traditional "I've Been All Around This World." Coalescing out of the thriving San Francisco music scene in the early '60s, The Grateful Dead combined the folk and bluegrass roots of guitarist Jerry Garcia, the electronic music penchants of bassist Phil Lesh and the R&B, blues and rock backgrounds of Bob Weir (guitar), Bill Kreutzmann (drums) and Ron "Pigpen" McKernan (keyboards, harmonica, vocals) into a whole new kind of American music. Favorites on the psychedelic dance hall scene, the group cut their debut album, The Grateful Dead, in 1967. It was followed by a series of efforts that sought to capture the propulsive power and endlessly inventive instrumental interplay of the band's live shows. Anthem Of The Sun (1968) and Aoxomoxoa (1969) combined both studio and live tracks to create intriguing aural montages, while 1970's Live Dead was a double album showcase of the Dead's awesome performing prowess. Workingman's Dead, also released in 1970, marked an abrupt change in the band's recording approach. That album's acoustic, folk-flavored originals were echoed on American Beauty, recorded at the end of that very busy year. A second double live package, Grateful Dead, hit the streets in early 1971. With the addition of keyboardist Keith Godchaux and vocalist Donna Godchaux, the group embarked on an extensive European tour that yielded the triple album set Europe '72. Captured live at the Fillmore East on Feburary 13 and 14, 1970, History Of The Grateful Dead, Vol. 1 (Bear's Choice) was released in 1973 and highlights the band's best live material just prior to the stylistic changes on the Dead's subsequent album output. Early clues of changes to come can be heard on the Garcia/Hunter original "Black Peter," a road-tested favorite that would later grace Workingman's Dead. Other standout cuts include "Katie Mae," and a smoking R&B workout, "Hard To Handle," with growling vocals courtesy of Pigpen. CD Pre-Mastering by Joe Gastwirt. Assisted by Dave Collins. This album was recorded live at Bill Graham's Fillmore East on February 13 and 14, 1970 and was released on July 13, 1973.